Recently, I’ve been on somewhat of a health kick. I’ve been embracing healthy eating and exercise, heading to Florence a couple of months ago for a yoga holiday and a couple of weeks ago I successfully survived my first 3-day juice detox. 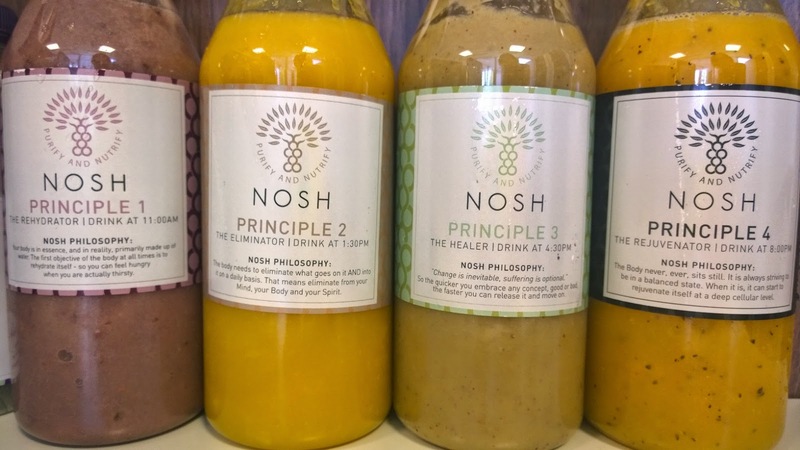 While I can’t recommend the company I used (Nosh Detox, who messed up the delivery AND ended up delivering the wrong detox kit), I highly recommend undertaking a juice detox to give your digestive system a break as well as giving you some food for thought when it comes to, well, food. During my detox I thought about food a hell of a lot, though I wasn’t hungry often. I also realised that I ate due to boredom and habit rather than actually being hungry, which was a bit of a revelation and as a result I’ve been snacking much less since I came off the detox. I wanted to share my detox diary with you to give you a glimpse first hand at what it’s like to go on a detox. 10.45am – No sign of delivery man, no sign of juice. Have emailed Nosh Detox and had some water. Someone at work has bought in Cornish fudge – becoming an increasingly attractive food option as opposed to fresh air and water. 10.52am – Apparently my detox box is being delivered TONIGHT. Despite emails yesterday saying I will be starting today and letting me know the juices will be delivered in the evening AND another one this morning saying enjoy the programme. 11.28am – After a not too pleasant phone call (sorry, I get angry when starved), my juice is finally going to be delivered today by the Business Manager. He’s going to be an hour but I’m tempted to kiss him when he arrives. 12.20pm – My juice arrival is imminent. I’m hungry but coping surprisingly well, whizzing through my to do list and even taking part in office banter. This is probably the longest I’ve gone without eating, ever. 12.44pm – Ever seen someone down juice like a shot of tequila? My colleagues have. 2.52pm – Triple fried truffle fries. 3.58pm – Colleague jogs my memory to drink juice 2, I hadn’t even realised. My Eliminator juice tastes really nice and healthy, must be the acai powder. 5.23pm – Triple fried truffle fries…with ketchup. 7.21pm – Third juice drank. Still dreaming about chips, which I haven’t eaten in forever. I kind of miss chewing. 7.34pm – Leaving work, skipping a party and going home to snuggle on the sofa with a blanket. I have no energy whatsoever. And I still miss chewing. 8.52pm – Been lying on the sofa wrapped in a blanket for an hour. Just had my last juice and surprisingly, I don’t really feel hungry. Genuinely don’t, convinced that 90% of my eating is habit. 7.30am – Woke up after a very deep sleep feeling pretty good! Not drained or tired but very rested. 8.52am – Juice time, really enjoy the taste of the Lemon & Ginger Tonic. 10.32am – Two hour meeting. Goes well. Thank goodness for herbal tea. 12.47pm – Juice one, done. Craving pizza pretty badly but actually not that hungry, just miss food rather than needing it. 1.44pm – I really want cheese on toast. 2.34pm – Another juice down. Still want cheese on toast. 3.29pm – SO TIRED. Just want to sleep. Seriously contemplating crawling under my desk for some shut eye. 4.56pm – So hungry now. Slight headache. Daydreaming about eating food. Safe to say the detox blues have hit. 7.18pm – At a picnic surrounded by cheese, crackers, sausage rolls, chicken and fruit. Slightly suicidal, not going to lie. Juice time soon, thank God. 8.21pm – Juice has curbed any food cravings. Still, turned my back on the picnic! 10.34pm – Bedtime. Earliest I’ve gone to bed for a long time. 7.30am – Another blissful deep sleep. Today is supposed to be the worst day as my system will really be detoxing. Cannot wait…. 10.53am – Not even hungry. Breezing through with juices and water now. Waiting for the side effects/mood swings to hit. 2.54pm – Still nada. Honestly, this has been a breeze. Not noticed any drastic changes in my body but I’m finding it easier to concentrate, sleeping much better and I feel a bit more glowy. 3.07pm – Getting a bit peckish so having water. Daydreaming about Vapiano’s pasta. Water tastes the same. Kinda. 4.32pm – Penultimate juice done. Already planning tomorrow’s post-detox meals. 7.04pm – An HOUR to go til my last juice. Already pretty hungry but I haven’t experienced any mood swings or, more crucially, regrets. It’s been a little tough at times but overall not as terrible as I expected. Roll on the 8pm juice and an early night….and my eggs florentine tomorrow. 8.23pm – Last juice. A bit emotional. Debating doing another detox in a couple of weeks. So there you have it. A few wobbles and hungry times but I got through the detox in one piece….and already planning the next! Although I felt tired at times and had a couple of early nights, I actually slept like a baby and woke up with more energy in the mornings. Keep your eyes peeled for my next post where I’ll be sharing my top tips for getting through a detox in one piece!